Natural catastrophe events in the United States accounted for three of the five most costly insured catastrophe losses in the first half of 2014, according to just-released Swiss Re sigma estimates. In mid-May, a spate of severe storms and hail hit many parts of the U.S. over a five-day period, generating insured losses of $2.6 billion. Harsh spring weather also triggered thunderstorms and tornadoes, some of which caused insured claims of $1.1 billion. The Polar Vortex in the U.S. in January also led to a long period of heavy snowfall and very cold temperatures in the east and southern states such as Mississippi and Georgia, resulting in combined insured losses of $1.7 billion. These three events contributed $5.4 billion of the $19 billion in natural catastrophe-related insured losses covered by the global insurance industry in the first half of 2014, according to sigma estimates. The $19 billion was 10 percent down from the $21 billion covered by insurers for natural catastrophe events in the first half of 2013. It was also below the average first-half year loss of the previous 10 years ($23 billion). Man-made disasters added $2 billion in insured losses in the first half of 2014, sigma reports. The $21 billion in insured losses from disaster events in the first half of 2014 was 16 percent lower than the $25 billion generated in the first half of 2013, and lower than the average first-half year loss of the previous 10 years ($27 billion). Total economic losses from natural catastrophes and man-made disasters reached $44 billion in the first half of 2014, according to sigma estimates. More than 4,700 lives were lost as a result of natural catastrophes and man-made disasters in the first half of 2014. 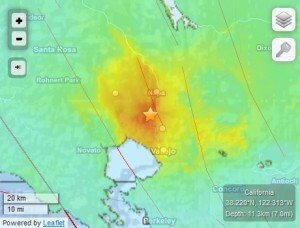 Strong Earthquake Strikes Napa: Business Impact? One day after a magnitude 6.0 earthquake struck the San Francisco/Napa area of California, the Northern California Seismic System (NCSS) says there is a 29 percent probability of a strong and possibly damaging aftershock in the next seven days and a small chance (5 to 10 percent probability) of an earthquake of equal or larger magnitude. The NCSS, operated by UC Berkeley and USGS, added that approximately 12 to 40 small aftershocks are expected in the same seven-day period and may be felt locally. As a rule of thumb, a magnitude 6.0 quake may have aftershocks up to 10 to 20 miles away, the NCSS added. According to Dr. Robert Hartwig, president of the Insurance Information Institute (I.I.I. ), this earthquake is the strongest to impact the area since the 1989 Loma Prieta quake which resulted in $1.8 billion in insured claims (in 2013 dollars) being paid to policyholders. Initial reports suggest the greatest damage has been to historic buildings in the city of Napa, with the downtown area cordoned off to fully assess damage. There have also been reports of non-structural damage such as items falling off shelves, including wine bottles and barrels, and substantial sprinkler leakage to many buildings. The Napa region is most known for its wine industry, but tourism draws visitors to the area year-round. A report by catastrophe modelers CoreLogic EQECAT gave an initial estimate of $500 million to $1 billion in insured losses. Residential losses would account for about one half to one quarter of this loss estimate. CoreLogic EQECAT noted that the Napa Valley wine harvest was already underway. Losses would have been less if this event had occurred pre-harvest. According to the Napa Valley Vintners Association, while there have been reports of damage at some Napa Valley wineries and production and storage facilities, particularly those in the Napa and south Napa areas, vintners are still assessing their individual situations. 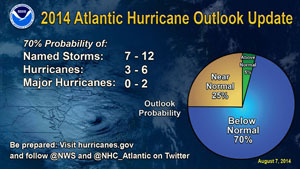 More information is expected in the next 24 to 72 hours. Standard homeowners, renters and business insurance policies do not cover damage from earthquakes. Coverage is available either in the form of an endorsement or as a separate policy. I.I.I. earthquake facts and stats show California had the largest amount of earthquake premiums in 2013, at $1.6 billion, accounting for 61 percent of U.S. earthquake insurance premiums written. This figure includes the state-run California Earthquake Authority, the largest provider of residential earthquake insurance in California. Only about 10 percent of California residents currently have earthquake coverage, down from about 30 percent in 1996, two years after the Northridge, California, earthquake. The percentage of homeowners and renters who have earthquake insurance in the affected area is very low — in Napa less than 6 percent, and in Sonoma less than 10 percent, according to the California Earthquake Authority. Check out key facts from the I.I.I. on the insurance industry’s contribution to the California economy here. Forecasters’ Twitter feeds are alight this morning as to the potential development of two systems in the tropical Atlantic. The NHC gives the first disturbance currently located several hundred miles east of the southern Windward Islands a 50 percent chance of tropical cyclone formation in the next five days. The second disturbance, a tropical wave located 1,000 miles east of the Lesser Antilles, has a low (20 percent) chance of tropical storm formation in the next five days. 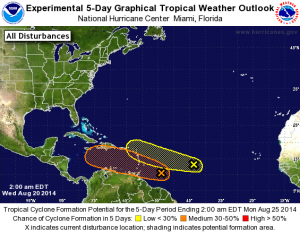 Over at Weather Underground, Dr. Jeff Masters noted that if the first disturbance (designated Invest 96L by the NHC) does develop, it would likely be similar to Tropical Storm Bertha of early August while it is in the Caribbean–a weak and disorganized system that struggles against dry air. Meanwhile @EricHolthaus tweets that Invest 96L could be a tropical threat to the U.S. next week, based on the first model runs. It’s still too early to tell, but Hurricane Hunters are on call to investigate 96L Thursday afternoon if necessary. And a shout-out to Paul Dzielinski of The Dec Page who hosts Calvalcade of Risk #215 Dog Days of Summer edition here.